The original Adaptiv is a dynamic multimedia product designed to evolve your vehicle’s system without the need to change your original stereo. A simple installation of the interface will allow you to receive the benefits of beautifully rendered navigation, reverse camera connectivity, video playback, DAB radio, and a host of connection types for your devices including USB, Aux, SD and HDMI. features dependent on vehicles application and additional products. Navigation - Latest iGO Primo mapping for Australia and New Zealand. Adds navigation to vehicles that may not have navigation or the latest maps. SD Mapping slot is on a separate to SD Card input. SD Card Input allows playback of a wide variety of audio, video and image files. Audio files supported are MP3, AAC, FLAC, APE, Video - MPEG, AVI, FLV, WMV, MP4, MKV, OGM, Image - JPEG, PNG, GIF. Album art is also supported in audio playback mode. USB input allows playback of a wide variety of audio, video and image files. Audio files supported are MP3, AAC, FLAC, APE, Video - MPEG, AVI, FLV, WMV, MP4, MKV, OGM, Image - JPEG, PNG, GIF. Album art is also supported in audio playback mode. USB mode can also be used for software updates of the both the Adaptiv interface and also the Navigation software. Optional add on Features these add ons are available as a separate purchase. Bluetooth - The add-on Bluetooth module (currently available for BMW and Audi ADV-AU3, ADV-AU4 only) allows both handsfree calling and music streaming via A2DP. The handsfree function allows the user to view and dial from their phonebook, view recents, favourites, voice dial and also dial via the onscreen keypad. The module is also supplied with a microphone, which can be installed in a suitable location. The A2DP streaming feature, allows the user to play and control all their music wirelessly from a compatible A2DP smartphone/music device. Part number: ADVBT. Digital Radio - An optional DAB/DAB+ module is available which is controlled via the OEM controls. The plug and play module allows digital radio input with an easy to use GUI, allowing navigation of stations via alphabetical, ensemble or preset modes. Slideshow is also supported (where available). Part number: ADVDAB. DVBT HD TV Tuner - Add a digital TV tuner which can be controlled via the OEM controls. ADVDVBT2 is a HD DVB-T2 diversity receiver. HDMI The add-on HDMI module allows a high resolution input of both Apple and Android mobile devices. The input allows display of video and apps on the OEM screen. Part number: ADVHDMI. Head Unit / System: 5.8 QVGA colour display. Audi Multimedia radio in Glovebox. 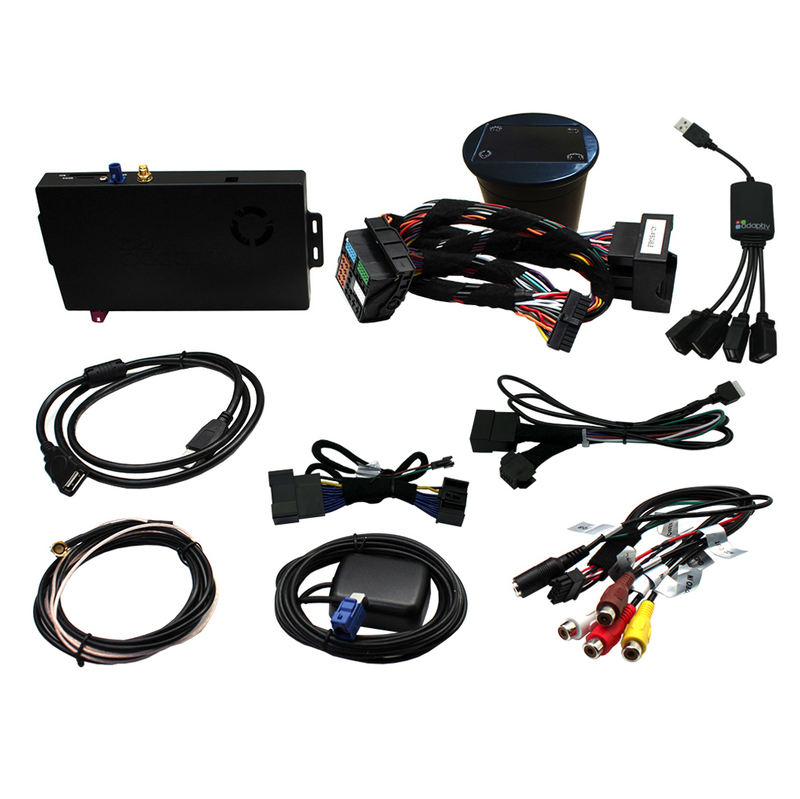 Vehicles with OEM Aux input only.